Los Angeles (AFP) - Life without LeBron James won't be easy for the rebuilding Cleveland Cavaliers, who are expected to take a significant step back after their native son's departure to California. After carrying the Cavs to four consecutive NBA Finals appearances, including a memorable first championship win in 2016, James joined the Los Angeles Lakers to create a gaping hole in the team he left behind. Yet James' former team-mates are adamant that they can step up to fill the void. 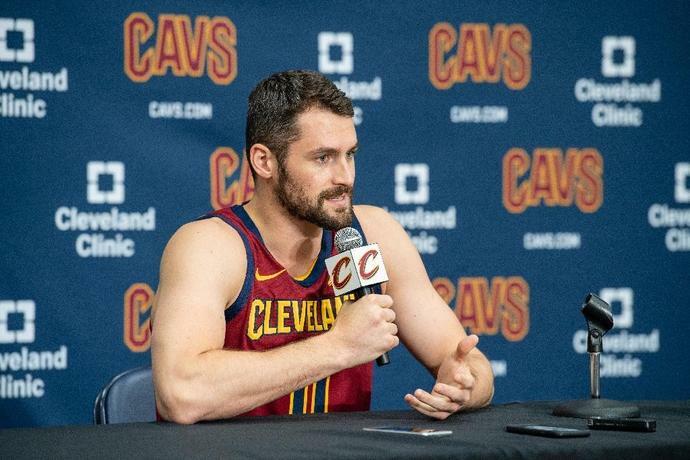 Kevin Love thinks Cleveland are going to surprise a lot of people. "Losing the best player in the world, we're going to have a fresh start," Love said. "We have first- and second-year guys who have to make an impact, and then veteran guys who have playoff experience under their belt." Tristan Thompson also believes any team underestimating the Cavs will be making a mistake. "We're a playoff team. That's realistic," Thompson said after Cleveland suffered a 129-110 loss to Detroit on Friday. "Everyone that says playoffs is overachieving doesn't know our squad and doesn't believe in our squad. For us, we're a playoff team. "We just have to go out there, be ourself and prove the naysayers wrong, which we will." Maybe James simply outgrew the Cavaliers when he left the first time. But this time around Cavaliers' fans aren't burning jerseys for taking his talents to Hollywood. Who can fault someone who brought the city its first title in 52 years, took them to the finals four straight seasons and built a school for special needs youth that will serve as a big part of James' legacy for years to come. Last season Cleveland pushed their way through the Eastern Conference playoffs before meeting the Golden State Warriors in the final. But the Warriors proved to be too much to handle, sweeping them in four straight. After a series of roster changes in the off-season, the Cavaliers will have different expectations than past years. Cavaliers open their season on Wednesday against the Raptors in Toronto. Love is now the face of the franchise while first round draft pick Collin Sexton hopes to throw his hat into the ring for rookie-of-the year consideration. Love, a 10-year veteran who won an NBA title with Cleveland in 2015-16, has changed his game for the better and is still one of the best power forwards in the league. The 30-year-old American quickly signed a four-year $120-million extension to stick around as the leader of the offence. "The only thing I didn't want was I didn't want to be with a team that was going to tank or not be competitive," Love said. "I wanted this to be a building year and still be competitive. They had told me they didn't want to take a huge step back. "Obviously, losing LeBron, you know what is going to happen with that. But I wanted to be part of something where we could continue to strive for all those banners up there." Cleveland will try to build a new identity with a healthy combination of veterans and young players. Among these young players is eighth overall draft pick Sexton, who showed off his skill during summer league action and will look to make an immediate impact at point guard. Johnson clearly intended to fire Lakers coach Luke Walton. Then, Johnson stunningly resigned as Lakers president. Still, the Lakers and Walton "mutually agreed to part ways," as team described it.